I had a crazy “adventure” this week! I say crazy because it is December and I needed a gluten free sugar cone and quick! I found out on Monday that Sam’s kindergarten class was going to be making a snack for their winter celebration. The snack was going to be a Christmas tree made out of a sugar cone! I have GF cake cones on hand by Goldbaum’s (LOVE THEM!) but no GF sugar cones. None of my local stores had any in stock so I looked into ordering some and having them shipped overnight… but not for $60 in shipping! So, I started Googling away. When I search for a recipe, I do two things. I do a web search for a gluten-free recipe of what I want and I also just search for what I want, without the gluten-free tag. I like to compare and contrast ingredients, methods and techniques. I also like to look at pictures. If a recipe does not come with a picture, I move on to the next one (usually). I like to know what I am getting myself into. After perusing the internet for an hour or so, I settled on 3 recipes, 2 regular recipes for waffle cones and 1 gluten free recipe. I made my tweaks on the regular recipes and followed the GF recipe very closely (with just an exception or two). Of the recipes I tried (time was of the essence). I liked the gluten-free recipe best. The next time I make these though, I will probably omit the vanilla because the regular recipes did not call for vanilla and I think the flavor was more authentic to the store-bought sugar cones. To be clear, I was looking for a sugar cone, like the cones in the box and not a waffle cone which are usually what you find in an ice cream parlor and a freshly made. 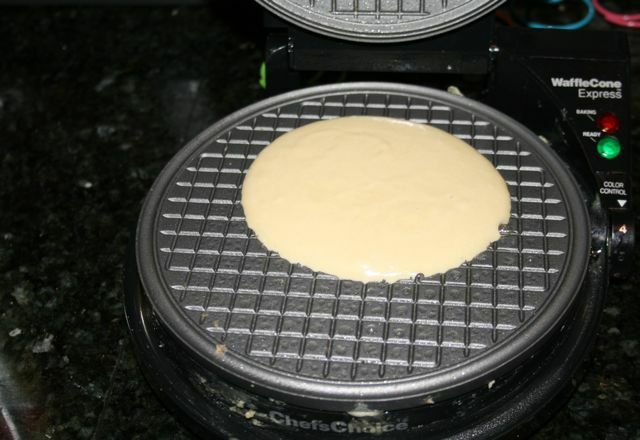 Heat waffle cone press (I have a Chef’s Choice 838 Waffle Cone Express) to about darkness level 3-4. In a medium mixing bowl, whisk together the egg, egg white and salt. Blend well with fork. Add the sugar, blend until sugar dissolves. Add coconut oil (or substitute), white rice flour and vanilla. Whisk to combine. When your light comes on and the machine is hot, (we sprayed the plate with non-stick spray first) spoon 2 full Tbs. of batter (we used just under 1/4 cup of batter) into the center of the waffle plate. Press down lid and let cook 60 seconds, check for doneness, if more time is needed, go another 30- 60 seconds (depending on how brown you want the cone to be) (We cooked ours for 2 1/2 minutes). To cool, place cone upright in a tall iced tea glass, (we used the holders from our snow cone machine we got at Target when Sam had his tonsils out last summer) and get to work on the next one. You can also make them into cookies (Pizzelles) and serve those with ice cream in a bowl. Spray the plates first with non-stick spray. I was beginning to think that this project would not end well! Apparently, this is common although probably not to this degree. 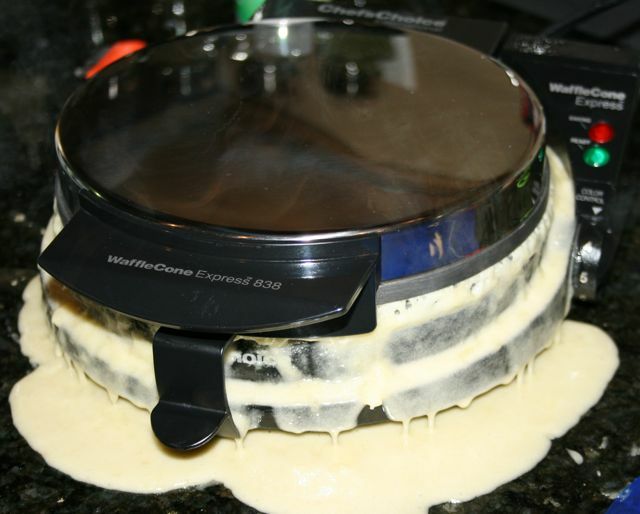 😀 There are little "canals" on the sides of the waffle cone maker for excess batter to escape. To make a sugar cone, I trimmed the top to make an "even" edge. I use the term "even" loosely. LOL! 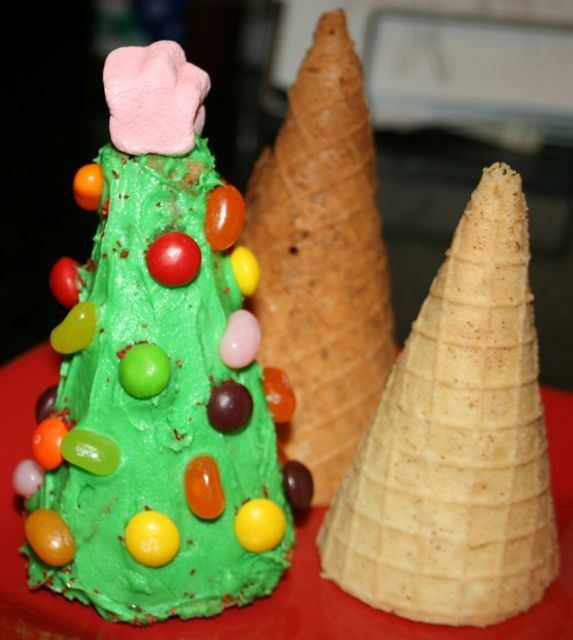 To make a Christmas tree, invert the cone and coat with green frosting. We decorated ours with Jelly Belly's, Skittles and a red star marshmallow by Kraft. Love that you two did this for your son! It would have been a fine life-lesson to say no, but what a demonstration of love to work so hard to say "yes!" 🙂 I look forward to making cones for my family, too! Oh, you are a qnderful Momma! Do you think I could somehow pull these off in a regular waffle machine..or is this a regular waffle machine but with the rolling tool? 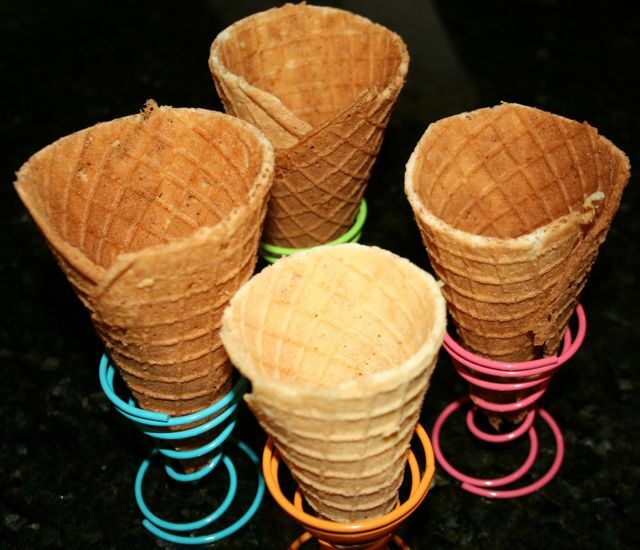 Ohh I miss waffle cones!